BALTIMORE – Popular Charm City guitarist and bandleader Michael Joseph Harris is taking his role as a musical ambassador to a new level with the 2016 release of two new Gypsy Jazz albums and a summer concert tour of over two dozen American cities. The album Coquette was recorded by his group Hot Club of Baltimore, focusing on the repertoire of legendary Belgian born French guitarist Django Reinhardt. Reinhardt famously perfected a Roma swing style in the 1930s and 40s recognized to this day by millions of music lovers. On this, Hot Club’s second album, listeners will hear songs such as lighthearted, playful title tune “Coquette.” Essential to the Django repertoire, it’s become a popular jam song at numerous Django jazz festivals. This album version features violin, clarinet, and two guitar solos performed on vintage French gypsy jazz guitars; a 1940's Selmer for Michael Harris and a DiMauro for guitarist Sami Arefin. In contrast, “Lover Man,” on the fourth track, is a beautiful ballad from the Django songbook given a simple treatment in which Harris’s lead guitar work is complemented by Ed Hrybyk’s bass. Hot Club has played a steady stream of concerts and earned abundant press. Says Tom Cole of Pacifica Radio’s WPFW, “These folks can handle the complexities and breakneck speeds of Roma swing. In 2016, we can come close to the experience of what it must have been like to hear Django Reinhardt play...in 1937.” The success of that ensemble led Harris to form a related combo in 2013 to bring contemporary Gypsy Jazz to a new generation of listeners. Known as Ultrafaux, his second group enlists core Hot Club members bassist Ed Hrybyk and rhythm guitarist Sami Arefin. As Ultrafaux, the trio shape-shifts to perform original music composed by Michael Joseph Harris rooted in the Jazz manouche style. Quirky compositions with mirthful names and effective hooks quickly turn listeners into fans. Appropriately named Deuxieme, the new Ultrafaux album features tunes such as “Zazzous Swing,” which takes the listener to the streets of Paris in wartime 1940's when the "Zazous" swing kids danced after curfew to express their independence under the Nazi occupation. “La Valse de la folie” is a more complex offering - a modern take on the traditional Roma waltz. The melody cascades between minor and major keys, giving it a contemporary feel. Translated in English as "Madness Waltz,” the tune has peaks and valleys of tension and release throughout. Venue hosts sometimes select one group or the other, but on many of these tour dates, Ultrafaux performs for one set and Hot Club for another, allowing fans to see two sides of the same coin. Vocalist Alexis Tantau from California performs on the latest Hot Club album and shares some summer tour dates with both bands. A popular YouTube video captures both groups in concert with Alexis at the mike. See Ultrafaux & Hot Club of Baltimore - Full HD Concert @ Creative Alliance: https://www.youtube.com/watch?v=jqr2WkuRPbA. Wesley Case features the group in a February 2016 article in the Baltimore Sun about the Charm City Django Jazz Fest at the Creative Alliance. The annual event is co-founded by Michael Joseph Harris. The tour begins in Maryland and moves on to New York City and Virginia before the trio makes their annual excursion to Northampton, Massachusetts to attend the Django in June festival. Guitarist Sami Arefin will coach beginning jam sessions while other members use the time to sharpen their axes and soak up new knowledge before the next leg of the tour. Hot Club and Ultrafaux then play a dozen West Coast dates, mostly in California. The Left Coast leg of the tour ends at the Grass Valley ranch where singer Alexis Tantau was raised. The musicians return to Baltimore with a date at Little Italy jazz supper club Germanos. After a brief hiatus in August, they’ll rally for more concerts and festivals such as Wisconsin’s Midwest Gypsy Swing Festival September 10 and Maine’s Django by the Sea on October 8. Music for Coquette from Hot Club of Baltimore and Deuxieme by Ultrafaux are available from bandcamp.com. 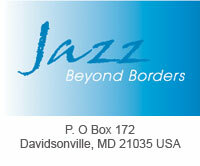 Look for information and tour dates on All About Jazz.com and Jazz Beyond Borders.com.